TODAY Suffolk Park is a very popular place to live. It has a beautiful beach nearby, there are great walks and modern amenities while the bright lights of Byron Bay are close enough to enjoy if you so desire. The early Suffolk Park was however quite different. In the late 1930s and early 1940s men in Australia were looking for work and often taking whatever jobs were available. One family found themselves at Suffolk Park because of this; a job was available in the zircon sand-mining plant on Tallow Beach. 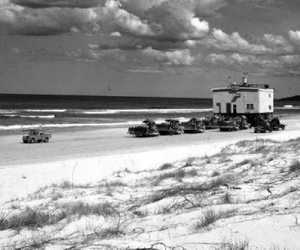 Bulldozers move a sand-mining plant along Tallow Beach. Suffolk Park at that time was just a clearing in the heath about where the camping area is now. The land was owned by George Suffolk and there were three shacks, two of which were available to zircon workers. The third was used as a holiday home by the Suffolk family. Each shack comprised four rooms on a concrete floor; two bedrooms, a living area and a kitchen. Meals were taken in the kitchen. There was no bathroom but the beach was nearby. A dunny was up a path among the ti-trees. Fresh water was collected in a tank. All the walls of the house, inside and outside, were made of hessian rendered with concrete and the windows were wooden shutters. There was probably an iron roof. A track led from the camp to the unsealed Ballina to Byron Bay road. The road had been made from white rubble called hailstone, possibly mined nearby. It would give up a cloud of white dust which was visible for miles through the heath when a vehicle passed. The dust cloud was used as a signal that the daily Farrell's bus from Byron Bay was on its way to Lennox Head and Ballina. Children from the Park families went to a one-teacher school at Broken Head. They would walk down the sandy track and wait to be picked up by the teacher who drove out from Byron Bay. They would be returned in the afternoon. One teacher was Percy Coulton who later joined the Army. Sadly, he spent most of the war in a prisoner-of-war camp in Malaya. Another teacher was Bill Bell, a young chap just out of teachers' college. Suffolk Park was an interesting place for children. There was the beach and the bush to be explored but it was also a popular place for young lovers, especially at weekends. Courting couples would ride their bikes out from Byron Bay and spend the day on the beach under the watchful eyes of the local children. Possibly they did not know that they were being watched. Other entertainment was provided by young men who came out, perhaps from a militia unit, to practise throwing hand grenades. These lethal weapons were actually "banksia men" which had fallen or were knocked from nearby trees. The children thought it was great fun watching them as they attempted to improve their skills. All provisions had to be obtained from Byron Bay. This usually meant a long walk along the untarred road to Tony Feros's shop. It was a tiring journey for the children but especially for their mother. The free bag of lollies from Tony's shop was most welcome at such times.